Idle Winds Guest Lodge boasts comfortable country accommodation, plus a health, wellness and beauty spa, the ultimate for de-stressing, relaxing the mind and revitalising the body. Established in 1989 and winner of many coveted awards, our restaurant makes every meal a relaxing experience. The lodge offers comfortable country style accommodation and the Wagon Wheel Pub, where you can enjoy a drink by the fire in winter or by the pool in summer. 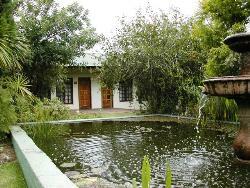 At present Idle Winds offers 23 comfortable, country style, double or twin rooms. All rooms have en-suite showers or bathrooms, tea and coffee making facilities, fans for summer, heaters for winter, M-Net television. A honeymoon suite is available for our wedding couples. Enjoy our health, wellness and beauty centre to de-stress, relax the mind and revitalise the body. We offer a full range of beauty treatments and body therapies. Our prize winning restaurant is long established and offers superb cuisine, wonderful service and a well stocked wine cellar. Idle Winds Conference Venue is the perfect venue for all your conferences, product launches, corporate functions, weddings and business meetings. We are 30 minutes drive from any point in Gauteng. Our tranquil surroundings and personal service will bring new life to any Conference, Launch or Seminar. A thatched area suitable for launches, exhibitions, gala dinners, theme evenings, weddings and social functions. An ideal venue for that exclusive function, business lunch or dinner. Idle Winds is an exclusive country venue, specialising in hosting that special Wedding Day. Idle Winds offers a complete service including a chapel set in magnificent gardens, a choice of venue and a Guest Lodge. The expertise of our experienced wedding co-ordinators will help you create a memorable day.